The Las Vegas Strip hosts one of the most recognizable New Years Eve celebrations across the globe. Thousands of people fill the streets for a chance to take part in the festivities and big name performers fill every nightclub slot possible. If this is not really your scene, or if you are looking for something a little different to do on your New Years Eve, check out Downtown Las Vegas! 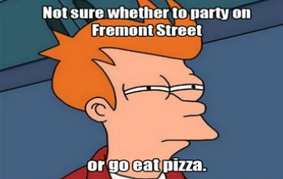 No matter what you decide to do, Pop Up Pizza is the best choice for a late night slice in Downtown after the party! Here are a few things that will be happening in the iconic Downtown area. This event will take place in the classic setting of the Fremont Street Experience. Cover bands will be taking over New Years Eve in Downtown. The event feature 13 of the world’s best tribute bands on three stages for nine hours on Dec. 31, 2014. If you can’t make it on New Years Eve, this lineup will be playing for a few days before and after the event. Tickets are $30 in advance and $40 at the door. Here are a few of the performers you can expect to see at this event. After your massive dose of rock ‘n’ roll, stick around to say goodbye to 2014 the Downtown way! This event will include a year-in-review to be played on the iconic Viva Vision above Fremont Street. A few words and the midnight countdown will be held by the City of Las Vegas Mayor, Carolyn G. Goodman. After the start of 2015, the event will feature an unforgettable live fireworks show which will be synched to the amazing virtual fireworks on the Viva Vision. This along with all of the other amazing attractions Fremont Street has to offer. Tickets (including admission to tributepalooza) can be purchased for $30 in advance or $40 at the door. This is the only night of the year where the Fremont Street is ticketed admission only. Another great option for those of your seeking something out of the ordinary. One of Downtown’s favorite bars, Commonwealth, will be hosting Puddles Pity Party to ring in 2015. If you are unfamiliar with the cult comedy/lounge performer, fret not. The giant performer, who has been popular in the Atlanta entertainment scene for years, is seven-foot-tall and dressed like a clown. The “sad clown with a golden voice” gained popularity after covering a well known song by Lorde. The unpredictable show is singing, intertwined with bits of comedy and improv to keep the audience guessing. He has performed to rave reviews in Las Vegas twice before and the New Years Eve lineup will show three times throughout the night. Tickets are $20 for men, $10 for women and $50 for the all-you-can-drink pass. No matter what you decide to do for New Years Eve, don’t forget to grab a slice of Pop Up Pizza before or after your celebrations. 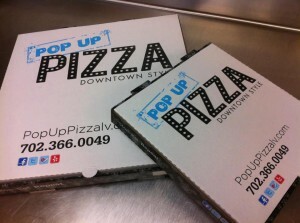 Pop Up Pizza, the best downtown pizza in Las Vegas, will offer delivery and catering services if you are hosting a New Years Eve party of your own. Pop Up Pizza offers a variety of specialty pizzas and toppings to build your own.